I made a mental note of creating a blog post about my son’s performance in big school for the first trimester after getting his report card from his homeroom adviser last September, but for some reasons, I keep forgetting to do my draft. He received very high marks in his major subjects, all 99s, and because of that his name was included in the Top Five of his class. 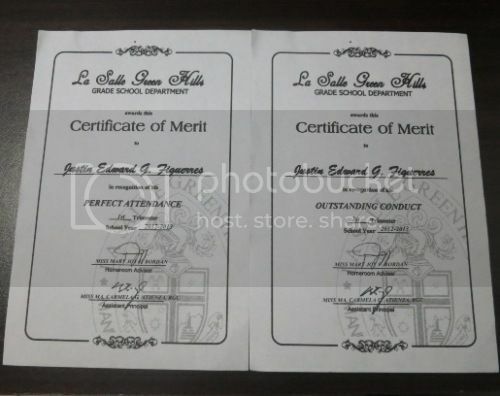 He was also given two certificates of merit: one for perfect attendance and another for outstanding conduct. 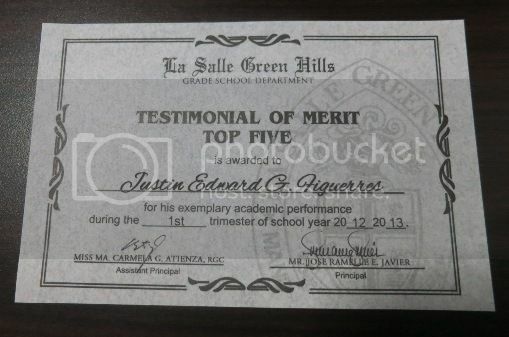 We’re really proud of you, Justin! Keep up the good work! This entry was posted in Big School, First Trimester, School Performance. Bookmark the permalink. Congratulations to your son and to you too for making it possible.. He certainly did well.